*** GUIDE PRICE 220,000 - 230,000 *** A lovely FAMILY HOME, ready to move into and in a GREAT LOCATION! The house is FREEHOLD, has a SOUTH FACING garden and has GOOD/OUTSTANDING schools (Ofsted rated) locally; five primary and three secondary. Accommodation is SPACIOUS, and there is a SUN ROOM, fitted bedroom furniture, PLENTY PARKING access, a GARAGE, and RECENTLY REPLACED double glazing. There is also a Yale alarm security system and CCTV to front and rear. Major road links are all close by so access to Newcastle City, the Coast and the A19, North and South is good, and there are several supermarkets relatively close by. The area is well serviced by bus routes and there are three metro stations a short distance away. Virgin Media currently supply Internet access here and it is believed to be around 200Mg. 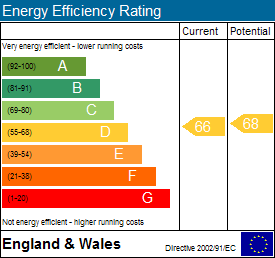 Council tax band C, Energy Rating D; call next2buy Ltd to arrange a viewing - 0191 2953322. Entrance Porch - A recent addition to the house - UPVc double glazed and with a tiled floor. Hallway - With a UPVc double glazed door from the porch and glazed panels that flank it. This is a lovely light hallway with a radiator, in a decorative cabinet and laminate flooring. Living Room - 3.95 x 4.05 (13'0" x 13'3") - UPVc double glazed bow window to the front, radiator, decorative coving and a feature Beech style fire place with an electric fire. There is open access to the dining area. Dining Area - 3.13 x 3.04 (10'3" x 10'0") - Radiator, and open access to the Conservatory. Sun Room - 2.17 x 3.07 (7'1" x 10'1") - With french doors to the rear garden and an insulated roof, all UPVc double glazed and with recessed lighting. Kitchen - 3.12 x 2.99 (10'3" x 9'10") - Another good sized room - UPVc double glazed window, part tiled walls and tiled flooring, and fitted with a comprehensive range of floor and wall units, counters and sink, electric double oven, electric hob and an integral fridge. In addition there is under floor heating in this room. Utility Room - 3.42 x 2.46 (11'3" x 8'1") - The handiest room in the house! 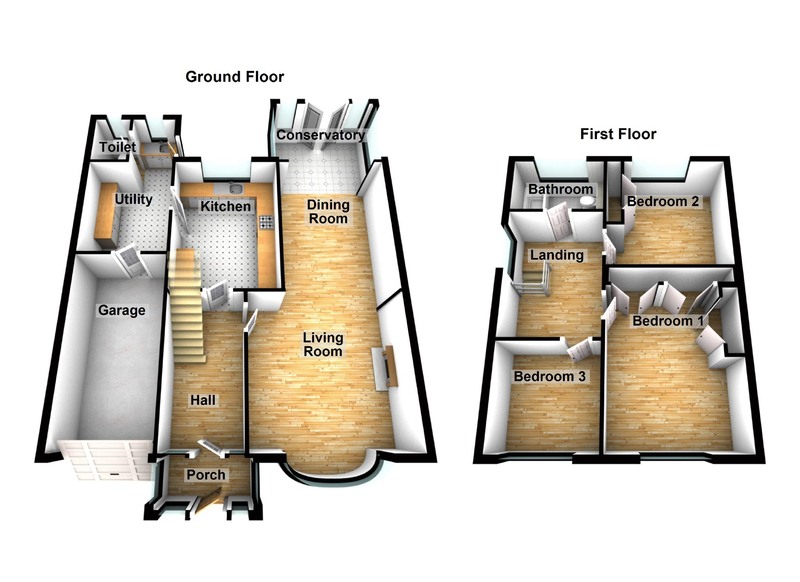 There is access to the rear garden, a toilet and into the garage, and there are floor units counters and a sink. Toilet - 1.52 x 1.06 (5'0" x 3'6") - UPVc double glazed window, toilet and a hand wash basin. Stairs To First Floor - A lovely spacious landing with a UPVc double glazed window, and loft access (laddered), leading to the bedrooms and bathroom. Bedroom 1 - 3.99 + wardrobes x 3.43 (13'1" +wardrobes x 11'3") - UPVc double glazed window, and radiator. Fully fitted with a range of wardrobes, fitted to two walls, drawers and a dressing table. Bedroom 2 - 2.79 x 3.43 (9'2" x 11'3") - UPVc double glazed window, and radiator. Fitted wardrobes to one wall. Bedroom 3 - 2.64 x 2.58 (8'8" x 8'6") - UPVc double glazed window, and radiator. Bathroom - 1.63 x 2.51 (5'4" x 8'3") - UPVc double glazed window, and a heated towel rail. Tiled walls and tiled flooring. Fitted with a three piece and a shower over the bath. There is storage fitted around the hand wash basin and toilet. Gardens - There are gardens front and rear. The rear is enclosed and has a lawn, a paved patio are and a decked area too. The front has a smaller garden area with planting and shrubbery. Garage & Drive - There is an attached garage with power, lighting, a remote controlled electric door, and an extensive block paved driveway for private parking.